Finally got the remaining potatoes planted. Who knew that 2# of seed potatoes would yield enough "eyes" for over 60 plantings? Because I got so many of them, they really are scattered willy-nilly all over the perennial gardens! 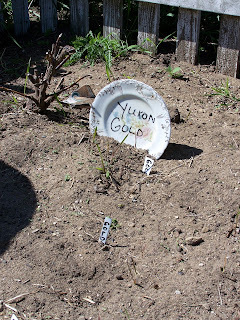 I marked each planting with a metal or wooden marker, but also took vintage dishes and wrote the potato variety for a more permanent "headstone". He never could see "eye to eye"
to be exhumed in the fall. OHMYGOSH! Too funny, that's what you are, CYN!! Cute...and I like the space you have on an old plate...I know what I'm on the lookout for at Garage sales this week! YAHOO! 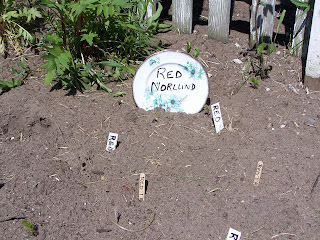 (Our potatoes are surrounding our garden...we got two kinds of red and some yukon gold.) Have a great day! maybe yukon will "come back" as tater tots or extra crispy hash browns, or even baked ... better yet the crem' de la crem' ...scalloped potates with extra cheese...you'll be inviting the whole congregation over for an "old country potato buffet"
you've got me giggling now! I love the plates for markers..just adorable!! I had a friend who had an antique shop in an old house years ago who used old plates to border a flower bed..it was really cute!! for a moment I thought maybe deer ate your potatoes! Glad to see that they are still intact. lol. I've seen funny but that is really funny! Very entertaining blog. The plates are waiting to be filled with potatoes. Hi Cyn, I wish I didn't have the room. My husband decided he was going to set me up a larg garden this year... only I did not realize the size he meant until I saw the cultivated area.. Now I have my work cut out for me. Good luck with yours, I will be needing it for mine! You are too funny! And very creative. I'm contemplating potatoes this year, but don't know a lick about them. I have a few "squares" for them, but am concerned about the bugs. You ever had problems with potato bugs? PS Pop over and check out my garden, or "Fort Knox" garden. The things we do to keep out critters and deal with really bad soil!